This AFCAD file represents a modification to the BluePrint Scenery Simulations (BPS) AF2_TJSJFSX.BGL file which is part of their recently freeware version of TJSJ - San Juan. Some of the enhancement include: updated approaches per the most current 2009 approach plates. AI custom parking at Terminals B, C, D and E per the October 2008 terminal parking maps. modified GA parking ramps. additional on and off-airport scenery including buildings and vegetation. additional fuel trucks and vehicle service roads. 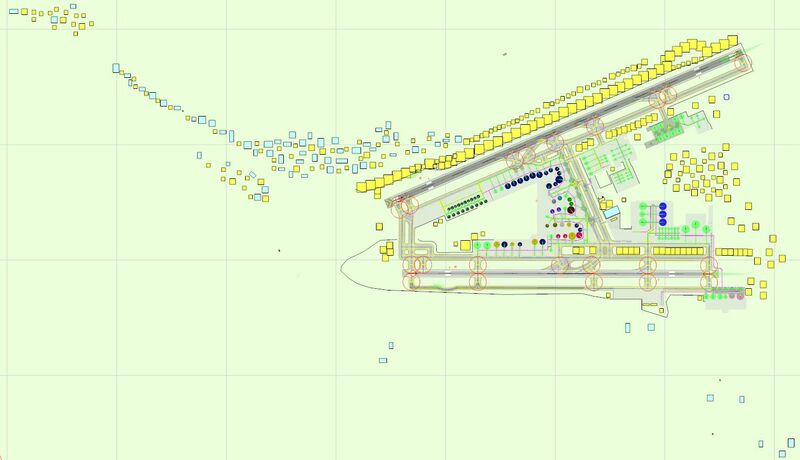 and AI parking spots added to the soon to be opened Terminal A. Terminal A parking is based on a preliminary parking specification which shows DAL/NWA and USA/AWE. By Kambiz Agazi. Overview of TJSJ - San Juan. I am providing this alternative AFCAD file with kind permission from BluePrint Scenery Simulations. Updated approaches per the most current 2009 approach plates. AI custom parking at Terminals B, C, D and E have been further refined per the Oct. 2008 Terminal parking maps. AI parking spots added to the soon to be opened Terminal A. BPS left off the parking intentionally until more information becomes available when the Terminal opens. I have used the proposed Terminal Parking Map which shows DAL/NWA and USA/AWE occupying Terminal A. I will revisit once Terminal A is officially opened. Note 1: I have included both airport and off-airport facilities and vegetation. The vegetation file included with the default BPS scenery is fps intensive and set at a scenery level of very dense. I would suggest that you remove or disable the BPS TJSJTreesFSX.BGL file and use the one included in this scenery. Note 2: The BPS Puenta Teodoro Moscoso (Bridge) over Laguna San Jose currently is set to a scenery level of extremely dense. If you fly with a scenery level less than extremely dense then you will need to modify the bgl containing the bridge and change the scenery level. I used BglAnalyzeX.exe by Winfried Orthmann and SDE by Jon Masterson (ScruffyDuck Software) to change the scenery level from extremely dense to normal. First, de-compile the TJSJBridgeFSX.BGL using BglAnalyzeX.exe. The de-compiled files will be xml and mdl. Using SDE open the xml and change the scenery density level to that desired. Then using SDE recompile the xml to a bgl. The mdl files must be in the same folder and will recompile with the xml. While satellite images were used to place off-airport scenery, including trees and buildings, the intent was not to mimic exact vegetation and building types shown in the satellite images but rather provide a similar streetscape layout. First, you must install the FSX version of the freeware BluePrint Scenery Simulations' TJSJ - San Juan scenery located at the link above. Once installed, locate your installation folder and inside of the scenery folder, replace the existing AFCAD file "AF2_TJSJFSX.bgl" with the one provided here. You can either remove the file from the scenery folder or rename it with a .passive at the end of the file. The object bgl file also included contains on and off-airport scenery and vegetation and is optional, but I would recommend including it in the BPS scenery folder as well. See Note 1 for more information. I have tested TJSJ_BPS_KA.bgl using FSX sp2, and while I don't anticipate issues with using the earlier versions (RTM and SP1), I cannot guarantee that the visuals will look the same on every setup. While not needed for the scenery to work, I also tested to ensure that TJSJ works with Scenery Tech Landclass and FS Genesis Mesh. CREDITS: TJSJ was modified using the powerful airport design utility by Jon Masterson (ADE9X V1.45.6). 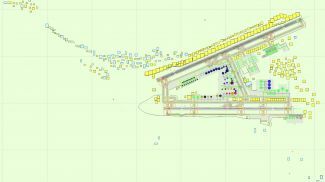 TJSJ - San Juan for FSX is a product of BluePrint Scenery Simulations. The archive tjsj_bps_ka.zip has 6 files and directories contained within it.